Coral Cay Conservation have teamed up with 4Ocean and Montserrat Island Dive Centre to conduct a large scale beach clean; removing marine litter from the beaches and reef of Carr’s Bay, Montserrat. 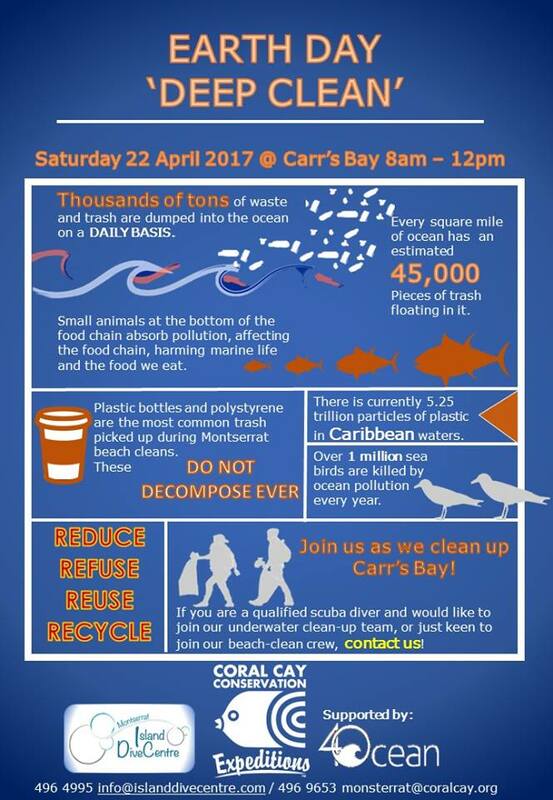 Celebrating conservation, the oceans and the planet, CCC staff and volunteers will aim to remove as much marine litter as possible. “Removing marine litter, including plastic bottles and discarded fishing gear, reduces it’s impact to marine life. We are facing unprecedented times with regards to marine litter, and only as a generation of doers can we actively combat marine pollution,” the CCC said. Hon. Minister of the Environment Claude Hogan has endorsed the clean up which takes place on Earth Day. He said the debris, much of which comes down in the guts during rains is an indication that continued education is important.